Birmingham’s Jewellery Quarter has long been heralded as the gem of the city centre, with a unique and distinctive character. With a growing resident population and increased emphasis on the Quarter as a tourist destination, there was a need to create a major new public space to provide a focus for activity, hold public events, and unlock the cultural and tourist potential of the area. 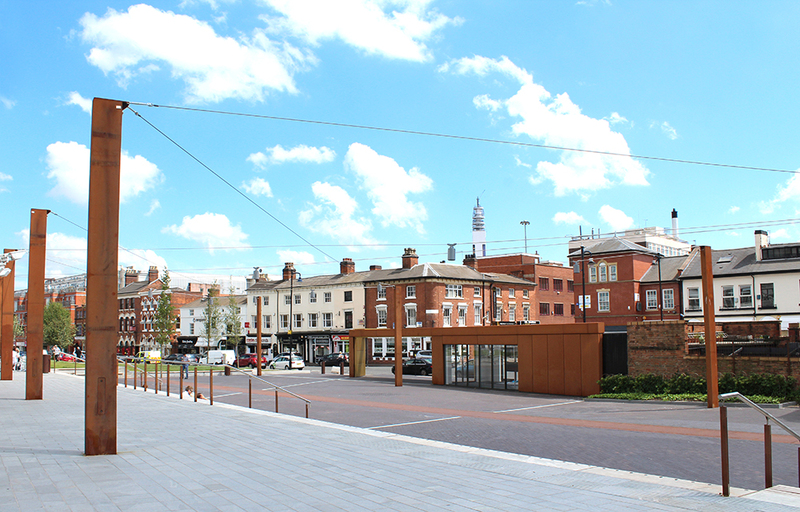 Working in collaboration with artist David Patten and Landscape Architects Capita, we were successful in winning the competition to redevelop a former surface car park in the centre of the Jewellery Quarter. The Golden Square is located in the very heart of the Quarter, with pubs, shops, cafes and offices immediately surrounding it. In any ‘place making’ processes, the design should adapt to the context to reveal the nature of a particular setting and the spirit of the Jewellery Quarter shaped our response. We brought together subtle ideas to form a bold diagram that reinforces the historic setting, and builds on the energies and culture unique to this part of the city. 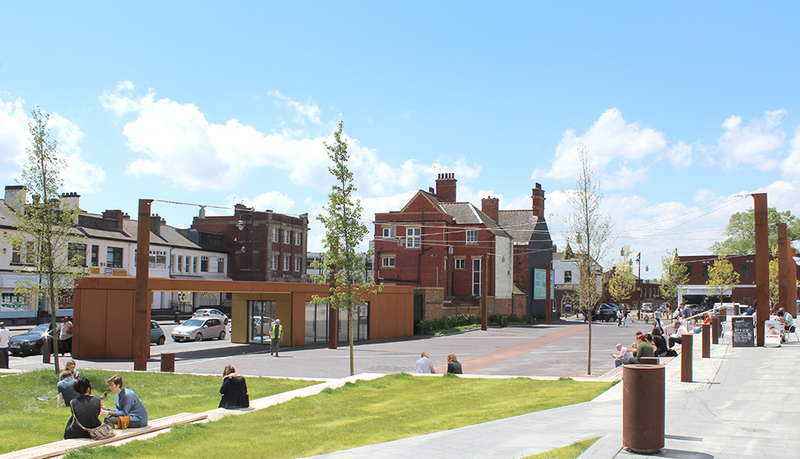 Golden Square is a set of ‘social spaces’ that connects the wider audience to neighbourhood activity and to individual experiences. It opens up new connections and market opportunities between makers, traders and visitors. 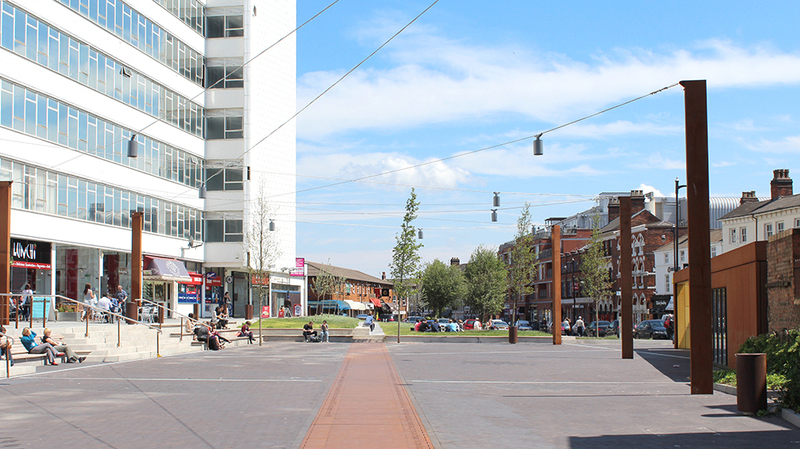 Being in Golden Square is to be part of the threaded experience that has always characterised the Jewellery Quarter. Exposed seams or “golden threads” orientate Golden Square towards the district’s traditional material sources and trading partners at the four corners of the world. These alignments help to shape the available space, manage the typography, and accommodate seating, lighting and animation. 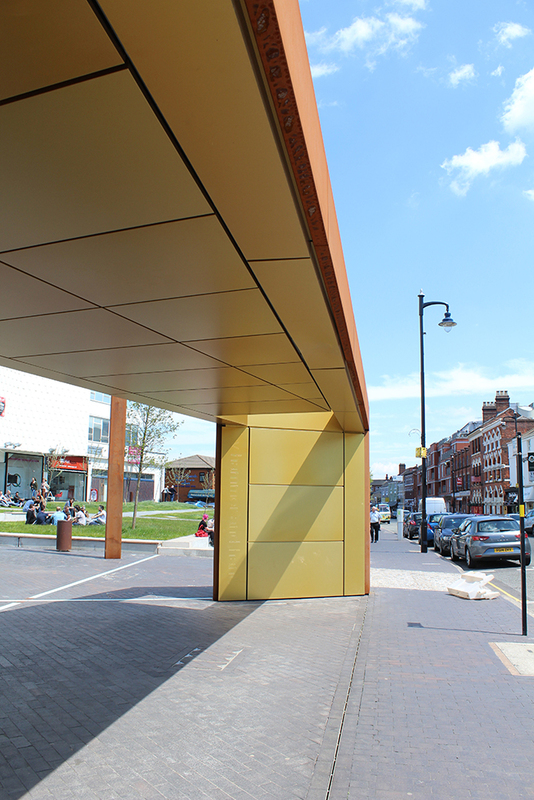 A canopy structure built from weathered steel is the termination of the golden threads in the landscape, symbolising the arrival of the raw materials into the Jewellery Quarter and their transformation into a precious object. The golden threads grow out of the floor scape and resolve into structural planes. 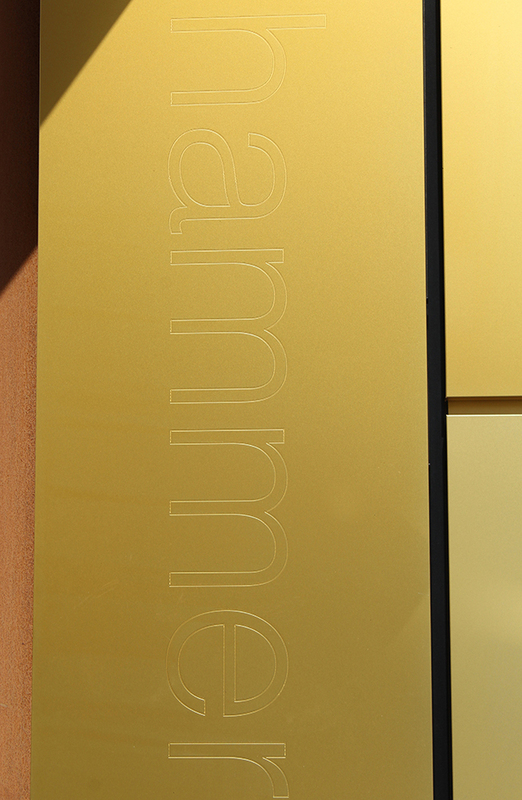 The planes fold across the threshold of the square forming an entrance canopy, and the underside is revealed as a gold surface that will glint when lit. 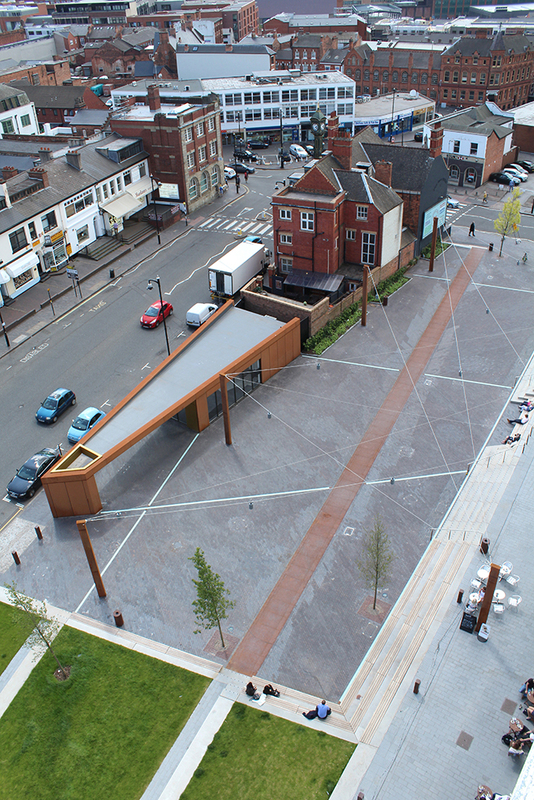 Completed in Spring of 2015, the square provides the Jewellery Quarter with an attractive and inclusive centrepiece and provides space for public events, temporary exhibitions, relaxation and interaction. It’s a valuable new amenity and aims to encourage further regeneration as well as adding to the distinctive identity and character of the Quarter.